Sunday night's episode featured the Top 5 artists each performing two songs live nationwide for American Idol judges Katy Perry, Lionel Richie and Luke Bryan as well as home viewer votes -- a song dedicated to his or her mother in honor of Mother's Day as well as a tune from former Idol winner Carrie Underwood's songbook. American Idol host Ryan Seacrest announced at the conclusion of the broadcast Cade and Michael had been ousted from the competition based on the results of the real-time, home-viewer voting that occurred as the finalists performed. Ryan revealed "just under 20 million votes" had poured in. 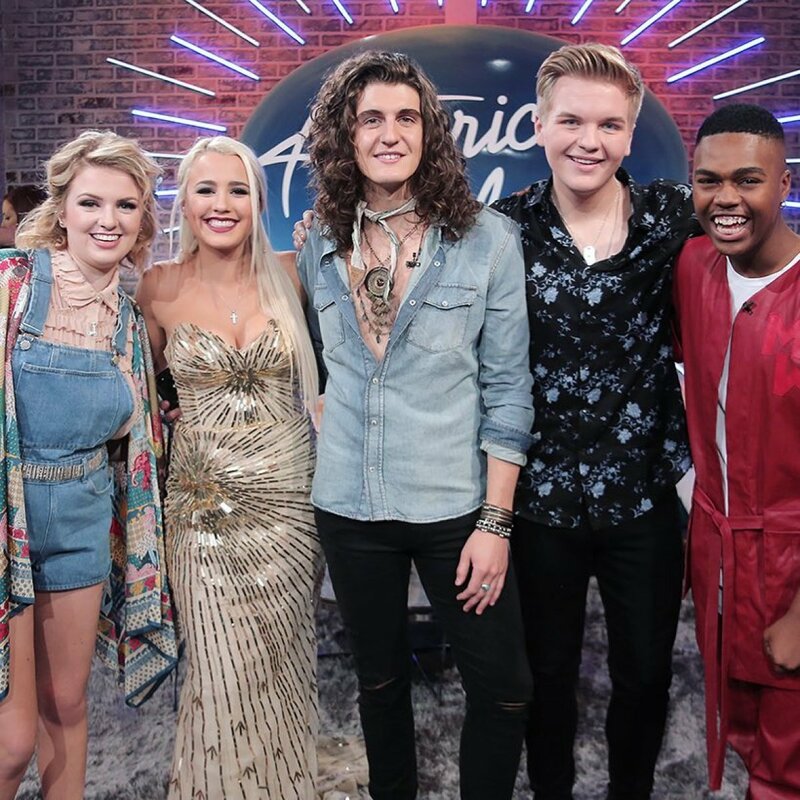 The season's Top 3 contestants who will therefore be competing in next week's finale are Gabby Barrett, Caleb Lee Hutchinson and Maddie Poppe. Michael kicked off the night with "Flat On the Floor" by Carrie, and Lionel said he started off "on a grand scale." Katy admitted there is no one like Michael "in this competition, in the music industry or on this planet" and he's such a unique artist, which will make him a star. Gabby then sang "Last Name" by Carrie and received a standing ovation. Katy noted Gabby has made a huge impression on fans because everyone is talking about her, and Luke said she was like "Carrie Underwood reincarnated" on that stage. Lionel added Gabby "was just fabulous." Cade sang "Undo It" by Carrie, and Luke explained how American Idol has really pushed the singer out of his comfort zone. Luke liked how Cade made the song his own and also complimented his growth in confidence. But Katy suggested Cadee should work on the dynamics of his vocal performance, meaning he could be more subtle at the start of a song and build upon that so he has more to play with. Caleb Lee took the stage with "So Small" by Carrie, and Lionel said he's "about as real as it comes." Katy said she admires Caleb's sense of humor and appreciates his authenticity; however, she confessed that other people in the competition are "physically outperforming" him. "You have to flap your wings a little harder when it comes to working that crowd," Katy explained, before Luke told Caleb he doesn't sound like anyone else. Maddie then performed "I Told You So" by Carrie, and she got all three judges up on their feet. Katy was lost in Maddie's world and noted time stood still during her performance. After Katy said she can't wait to hear Maddie's record, Luke gushed about how she's a perfect storyteller and should never over-think her performances. It then became time for the contestants to sing songs dedicated to their mothers. Gabby belted out and impressed with "I Have Nothing" by Whitney Houston. The judges raved and went wild over the performance. Lionel said it was "daring" and she accomplished the impossible, and Katy admitted she was blown away because she didn't even think Gabby had that kind of power, control and range inside of her. Cade sang "Simple Man" by Lynyrd Skynyrd. Katy loved to see a vulnerable and emotional side of Cade since he's always so strong. She thought his dynamics were much better in this song, and then Luke pointed out how America was "finally seeing what [he's] about." Michael then took the stage with "Still I Rise" by Yolanda Adams. After receiving a standing ovation, Michael was told by Lionel, "You are anointed, my friend." Luke and Katy were practically moved to tears. Caleb performed "Stars In Alabama" by Jamey Johnson. Luke complimented his song choice and being right in his wheelhouse, while Katy said he's something special and she'd love to grab a beer with him when he turns 21-years-old. Maddie closed out the show with "God Only Knows" by The Beach Boys. Lionel begged people to vote for Maddie, and Katy gushed about how the singer had done such a wonderful song justice. Katy added that Maddie's "taste is impeccable" and she should "trust it, always." Not only will the Top 3 artists perform in the finale, but they will also receive a hometown-hero welcome in the next episode.